Jul 30, 2013Episode 179 - Gong-Jo! Oct 08, 2013Page 197 - Tag! Oct 17, 2013Page 200 - Stab! Oct 24, 2013Page 202 - I object! Nov 05, 2013Revenge is Coming! Nov 12, 2013One Week to Go! Nov 19, 2013Page 205 - What the heck? Dec 17, 2013Page 209 - Title paaage! Jan 28, 2014Page 215 - The Fight Begins! Mar 04, 2014Page 220 - Orange juice? Jul 23, 2014Comic Con 2014! Sep 25, 2014American Choppers TPB coming in November! Jan 27, 20155 Years Later! 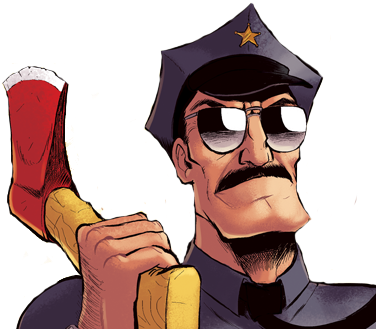 Jan 02, 2017Ask Axe Cop is Returning! Jan 16, 2017What is COMUSIC® technology? Jan 23, 2017Read Axe Cop Before Your Friends! Jan 24, 2017PARRY GRIPP Is On Our Team! May 18, 2017Axe Cop Never Says Uncle! Apr 17, 2018Check out my Kickstarter!